Further evidence that persistent ole fiction writers keep on rolling and can get even better with age. “Cowboy” – Familiar tale where a roaming cowpoke gets a job for nothing to prove his mettle, faces resistance, learns to be good at it, and eventually supplants those who hired him (young sumbitch becomes old sumbitch). Narrated in Festus vernacular, funny at times. “Old Friends” – a visitation format in which a former college pal on the lam (Erik) returns to see an old pal (Briggs). Briggs’ life is solitary and rural, but in good order; Erik’s life is fractured. A distant alumni gossip writer and the pal’s mean-spirited ex-wife are external haranguers who further upset Brigg’s tranquility. Oh, and also the loose gal Marge who Erik brings along, a pickup who can’t resist the degenerate Erik but decides to slap Briggs for being, we suppose, polite. There’s a denouement to all this when Erik’s gig is up. His life and Briggs’ life are forever affected. “North Woods” – A drug-addicted couple hike the deep woods outside Vancouver on a quest to find an object that they can trade for heroin. It’s the new world, and McGuane offers a great line to the effect: if you can look around in the woods up there and see plywood, you’re still an innocent. “Zombie” – Grim and gothic, a tale of vengeance out in the sticks. Reminiscent of writing by Flannery O’Connor with creepy characters, some who have weird teeth and others far weirder behaviors. “Ice” – Coming of age story involving a drum major, a promiscuous teacher, and a boy too far out on the ice trying to find his nerve. “Gallatin Canyon” – The title story indicates there is no escape from business, traffic, angst, tragedy – even in the remote hills out West. 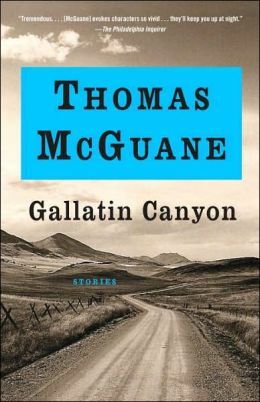 Posted in booknotes and tagged Gallatin McGuane review, Thomas McGuane review on December 16, 2013 by Wm P.